Celebrating the life of Edward W. Dissler, Jr.
Obituary for Edward W. Dissler, Jr.
Edward W. Dissler, Jr, age 85 years, of Quakertown, NJ, died Sunday, March 17, 2019, in Independence Manor, Flemington, NJ. 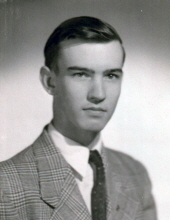 Born in Somerville, NJ, February 3, 1934, son of the late Edward W. and Mildred Lawson Dissler, he had resided in Quakertown, NJ most of his life. Ed was a 1952 graduate of North Hunterdon Regional High School and Raritan Valley Community College and was a self-employed bookkeeper, retiring in 1999. Ed was a lifelong member of the Quakertown United Methodist Church and was a member of the Quakertown Baseball Team of the former Tri-County League for several years. Funeral services will be held Wednesday, March 20, 2019, at 1:00 PM in the Holcombe-Fisher Funeral Home, 147 Main Street, Flemington, NJ. Interment will follow in Locust Grove Cemetery, Quakertown, NJ. Calling hours will be Tuesday evening from 7:00 to 9:00 PM at the funeral home. Memorial contributions may be made to the Quakertown United Methodist Church, PO Box 307, Quakertown, NJ 08868 or the Quakertown Fire Company, 67 Quakertown Road, Pittstown, NJ 08867. For further information or to send an online condolence, please visit www.holcombefisher.com. "Email Address" would like to share the life celebration of Edward W. Dissler, Jr.. Click on the "link" to go to share a favorite memory or leave a condolence message for the family.